On Friday and Saturday, the USD swimming and diving teams competed with several other colleges throughout the Midwest at Sioux Falls’ Midco Aquatic Center in the Coyote Invitational. The Coyotes left with a total of fifteen wins. A variety of schools attended the event, including South Dakota State, Sioux Falls University, Omaha, Iowa Central and St. Mary’s. Three USD athletes won multiple individual awards. Senior Sarah Schank, three-time winner of the Summit League Female Diver of the Week award, posted scores of 256.15 and 287.40 on the one-meter and three-meter dives respectively. Jared Thorson, also a senior, won the 100-meter butterfly (50.84 seconds) and the 50-meter freestyle (21.40 seconds) categories. Freshman Caden DeLay won the 100-meter breaststroke in 56.95 seconds, the ninth-fastest time in USD history for that category, as well as the 200-meter breaststroke. 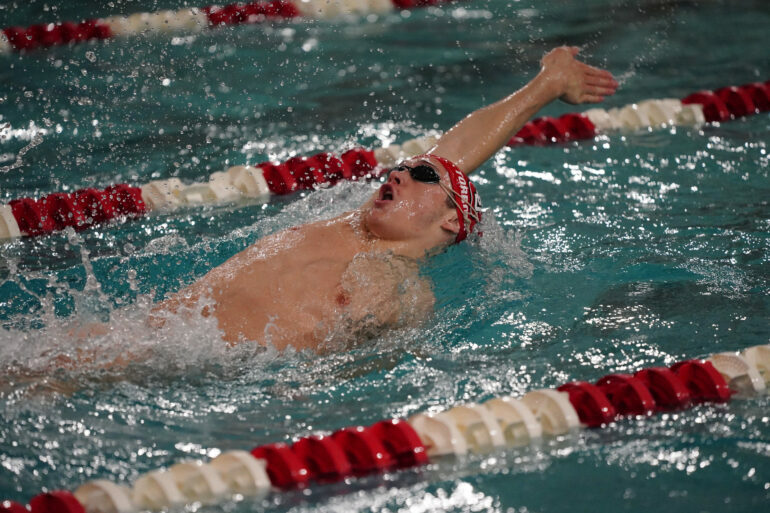 DeLay also won an additional two awards in the 200-meter freestyle relay and 200-meter medley relays, assisted both times by freshman Shane Sackett. In addition to four other individual wins, the men’s team shared a victory in the men’s 400-meter freestyle. This invitational adjusted many of the current standings in the USD swimming and diving record book. Junior Katie Coleman placed 9th in the 100-meter butterfly, and freshman Jordyn Schnell now sits at 8th place in the 50-meter freestyle category. Four Coyotes found their way into the top-10 list in the 100-meter individual medley category: Freshman Isabel Fairbanks (9th place, 1:01.21), freshman Isabelle Davenport (7th place, 1:00.55), freshman Cassie Ketterling (3rd place, 1:00.19) and sophomore Elbert Chuang (2nd place, 52.00). Junior Sabrina Sabadeanu moved up to sixth with her time of 1:00.41. Both the Coyote men and women swimmers won in the 800-meter free relay event, and senior Abby Hollub, a part of the latter group, discussed her plans before the Summit League Championships. Asked what she was looking forward to in the upcoming days, Hollub said “Psyching up for my last practices and being around my teammates,” while Morgan Holt, also a senior, concurred in saying that she looked forward to being done with the season, and spending the last days of the season with her closest friends on the swimming team. This was the final meeting of the regular season for the Coyote Swimming and Diving teams. The Summit League Championships run from the 20th through the 23rd of February at the Midco Aquatic Center.